In keeping with their own seafaring traditions, a number of Māori were keen to explore the world in the wake of European contact in the closing decades of the 18th century. In 1777 two Māori boys, Te Weherua and Koa from Queen Charlotte Sound / Tōtaranui were probably the first Māori to travel beyond New Zealand since the early seafaring days of their Polynesian ancestors. They joined James Cook aboard the Resolution as it sailed from New Zealand to Tahiti. Their fate is unknown. Others soon followed. By 1795, chiefs were sailing to Sydney aboard trading ships in search of bartering opportunities. Other Māori worked their passage on European and American vessels. A number of Māori also proved to be willing and eager recruits for the whaling ships that began arriving here from the 1790s. Described by one whaleboat owner as ‘orderly and powerful seamen’, Māori saw whaling as exciting and an opportunity to see the world. The first record of Māori on board a whaler came in 1804, and in 1826 one British whaleboat reported having 12 Māori crew. This 1823 painting shows Māori chiefs standing in the garden of a Sydney villa. Māori travelled to Sydney to explore trade and educational opportunities. Not all Māori went voluntarily. Some were kidnapped or taken on as crew, then maltreated and even abandoned overseas. The French explorer Jean François Marie de Surville and the St Jean Baptiste anchored in Doubtless Bay in late 1769. Initially he and his crew got on well with Māori in the area, but the relationship soured when he accused Ngāti Kahu of stealing a ship’s boat which had drifted ashore. In reprisal he burned whare and ‘arrested’ a chief, Ranginui. Strong winds then forced the ship to set sail and it headed east across the Pacific. No land was encountered and the crew sickened. Ranginui died of scurvy on 24 March 1770. In 1793 Northland chiefs Tukitahua and Ngāhuruhuru were kidnapped and taken on board a ship at the request of Lieutenant-Governor Philip King of Norfolk Island. King hoped he would be able to get them to demonstrate the techniques for manufacturing flax. The plan was a failure. The Norfolk Island flax was poor and the men, in any case, knew very little about dressing flax as it was primarily women’s work – Tukitahua was a tohunga, while Ngāhuruhuru was a warrior. In 1805, Bay of Islands-based Ngāpuhi leader Te Pahi, with four of his sons, travelled to visit Philip King, who was now Governor of New South Wales, having heard of his hospitability. They established a complex relationship based on trade and cultural exchange. In the same year the Ngāpuhi chief Ruatara, from Rangihoua in the Bay of Islands, left New Zealand on the whaling ship Argo with the intention of meeting King George III. Over the next four years he served on several whaling ships, receiving mixed treatment. He never met the King. That honour went to a fellow Ngāpuhi man, Moehanga, who became the first Māori to visit England in 1806. Missionary Samuel Marsden meets Ruatara's whānau at his pā at Rangihoua in the Bay of Islands in 1814. In 1809 Ruatara met the missionary Samuel Marsden, who was about to return to Port Jackson (Sydney), in London. Marsden ensured that Ruatara, who was in poor physical condition, was cared for and supplied with clothes during the voyage. Ruatara spent eight months with Marsden at Parramatta in New South Wales, studying European agricultural techniques, carpentry and other skills with the aim of introducing wheat to New Zealand. Marsden arranged a passage home for Ruatara on the whaling vessel Frederick. Ruatara took tools and a quantity of seed wheat but was defrauded of these items and abandoned on Norfolk Island. He was eventually rescued and taken back to Port Jackson before finally returning to Rangihoua in 1812. Ruatara’s relationship with Samuel Marsden helped pave the way for the establishment of the first Christian mission station in New Zealand in 1814. Governor Lachlan Macquarie of New South Wales supported Marsden's plans to establish a mission station and gave Ruatara a mare, a cow and other livestock, as well as a military uniform, to help further this aim. 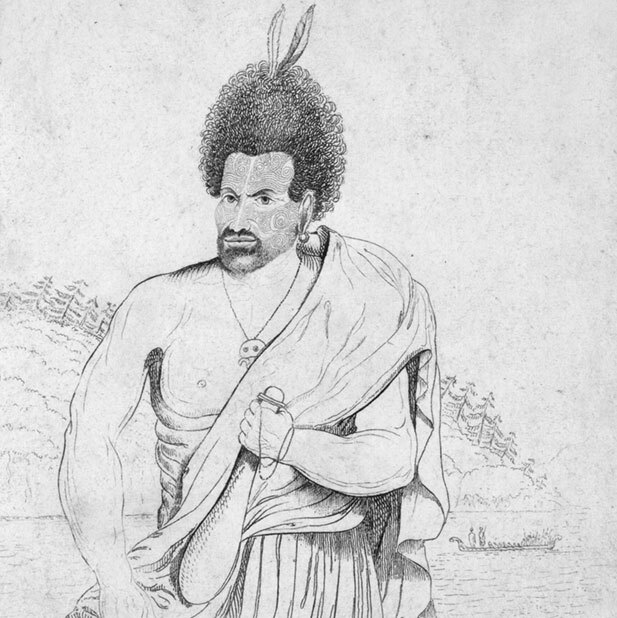 Ruatara assumed the role of protector and patron of ‘his Pākehā’ – the lay missionaries Thomas Kendall, John King and William Hall – when they arrived with Marsden on the brig Active on 22 December 1814. A site for the mission station was chosen the following day. Marsden delivered his first sermon on Christmas Day at Hohi (Oihi) Beach in the Bay of Islands, with Ruatara translating his words to the largely Māori gathering. In this early phase of contact, Māori had the upper hand. Europeans in New Zealand were dependent on Māori for their physical and economic well-being. Māori actively engaged with Europeans who they believed could increase the personal mana of individuals or the collective interests of hapū and iwi. Interaction with Europeans reflected Māori cultural values and expectations. Contact with Europeans was increasing, but still rare; by the early 1830s there were probably only a couple of hundred permanent European residents in New Zealand, but perhaps around 100,000 Māori. An important feature of early cross-cultural contact in New Zealand was role of intermediaries (kaiwhakarite) who acted as go-betweens – people from one culture who lived within the other culture and helped bridge the gap between the two. The relationships which were established in these early years of contact allowed Māori to assert their mana in the world. Evidence of this could be seen in the significant Māori economy that emerged, with iwi producing large amounts of food, including wheat and potatoes, to support the new European towns that began to spring up. They also sold goods overseas, some using their own ships which sailed back and forth between New Zealand and Australia. ‘The first Māori in Australia’: Radio New Zealand interview. The Te Pahi medal, a taonga of national importance which was given to Te Pahi to mark his visit to Sydney in 1809, is discussed in this Te Papa documentary. Maori and the Economy: Ngahuia Te Awekotuku, Vincent O'Malley, Anne Salmond, Haami Piripi and Mānuka Hēnare speak of Māori entrepreneurial endeavours in the early years of contact. We have 1 biography, 7 articles, related to Encounters.